New Kent's Lindsey Johnson (17) looks for room to convert a score against Jamestown's Sarah Jones (1) and Hadley Koenig (5). Even when some things change, the results can end up being the same. 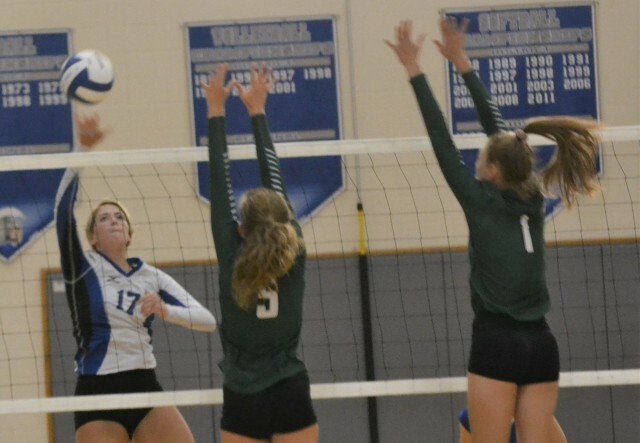 That’s what happened Thursday night as Jamestown’s Lady Eagles swept the homestanding New Kent Lady Trojans 14-25, 12-25, 10-25 in the Bay Rivers District clash. Despite not being the normal powerhouse as they usually are, Jamestown had an apparent difference. The visitors forced the Lady Trojans to rebound off hard strikes that they could not handle. Coupled with nine service errors and inability to get the ball over the net with any power, the mismatch became evident as the Lady Eagles easily claimed the first two sets. New Kent’s only true advantage came in the beginning of the third set, gaining a 3-1 lead before Jamestown outscored the hosts 24-7 to end the game. After the contest, Lady Trojan head coach Cynthia Burnett commented about the missed opportunities the home team had. “I thought Jamestown’s serving was better than ours,” she said. “We missed first serves and I saw some plays in which we wish could take back. New Kent drops to 3-6 while Jamestown improves to 3-2.